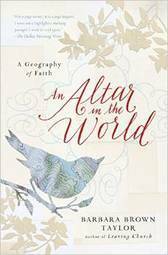 What the book's about: An Altar in the World is, quite simply, about discovering God beyond the walls of the church. Concerns about "Where I Belong"
My youth ministry's winter retreat is rapidly approaching. As part of this, each adult leader gives a short devotion in response to a prompt related to our theme. My church does not own vans. This means that with the exception of our summer trips (when we rent them), we depend on the goodwill of parents to drive us to and from various events, including our winter retreat. When I began my first job in youth ministry, the church I worked at was in the midst of worship wars: Fighting constantly about whether to have “traditional” or “contemporary” music. It's January. That means that once again, it's time for K-Love's 30-Day Challenge – something I have some concerns about. If you walk into my house, you'll notice stacks of books everywhere - evidence that I'm an avid reader.